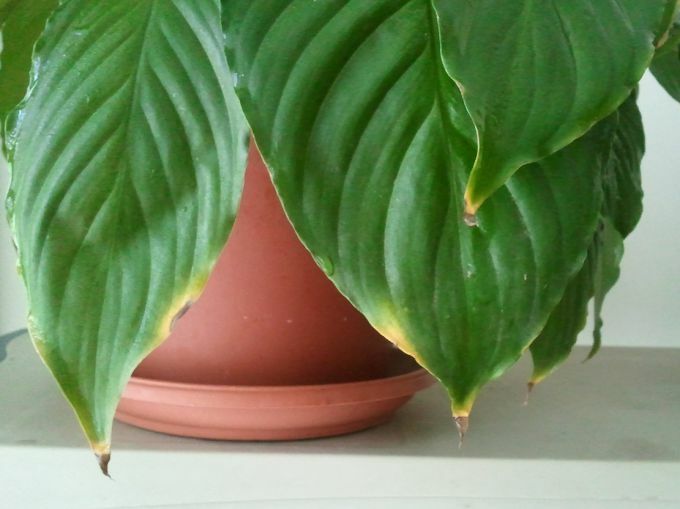 Why the Spathiphyllum leaves turn yellow? Spathiphyllum – the symbol of happiness, so when the leaves begin to turn yellow, the owner can think about the upcoming disaster and grief. But this phenomenon has a specific cause which does not relate to the future. The flower is sick, he needs urgent help. How often should I water the flower "women's happiness"
If you have started to turn yellow leaves, the first thing you need to think about the conditions of detention of Spathiphyllum. Often the flower is suffering due to improper temperature and lack of humidity. The two most common causes of yellow stains. The plant tells its owner that suffers from irregular watering and dry air. But it does not mean that you want to boost the amount of water, it will lead to rotting of the root system and death of the plant. Increase watering gradually and monitor the state of Spathiphyllum. We should not forget about spraying. The flower of happiness can not tolerate the neighborhood with heating. Put next to the plant pot tray of wet pebbles every day spray the leaves and sometimes arrange a warm shower. If the Spathiphyllum is a draft or in a cold room, it is better to find another place for this. The leaf turns yellow completely in the soil lacks nutrients. This problem can be solved in two ways: regularly feed the plant or give it a bigger pot and replant a Spathiphyllum. If the veins of the leaf remain green, the flower is not enough magnesium. However, he stops growing and becomes weak. But the reason the yellow leaves of the Spathiphyllum can be much more dangerous than improper care. To the death of plants can result in pests: thrips and mealybugs, and fungal diseases. To get rid of those uninvited guests, the first step is treatment with insecticides, the plants are then transplanted to another soil and after 14 days fed. Before transplanting, you need to carefully examine the Bush Spathiphyllum, cut off the affected part and treating the healthy areas with a fungicide.